Opposites by T.M. Smith first chapter revealed. "The tale Author T.M. Smith has created here for you is absolutely original and amazing. She writes an amazing cast of characters that you get involved with and really start caring about them." It has been a long, hard road to get Opposites where it is today. Release was set for tomorrow, May 28th, but I've found some mistakes during final edits that are hindering that release date. I'm confident that I will have these mistakes resolved over the next few days and I'm still certain I will be able to release before the end of May. My apologies to all the fans that have been anxiously awaiting this book, I promise it will be worth it in the end. So, to make it up to you all I've decided to reveal the first chapter. Without further ado, here is the first chapter of Opposites. The relentless chirping was driving Aiyan mad, as if his restless sleep and would be nightmares weren’t enough to push him over the edge. He rolled over and pulled the pillow up over his head, finally succumbing to more fitful dreams. In his dream the clearing was covered in fog and haze, there was a body of flames lying at his feet and he was so overcome with emotions he could barely breathe. Anger, fear and loss overwhelmed him. “You so cheated!” Their last match hadn’t ended well with Aiyan on his back and his sister straddling his chest. She harrumphed and made her way back out the door, down the hall. “So you say, care to go another round?” He stood in the middle of the room, motionless. “CHICKEN!” She yelled out, already half way down the hall. Aiyan dressed in his Gi quickly and made his way into the hall, following his sister. He caught up with her effortlessly in just a few long strides, towering close to a foot over her small waif frame. At first glance one would not even consider these two to be twins. Aiya had long, flowing white blonde hair with bold streaks of fuchsia, indigo, teal and purple throughout. The octopus tattoo on her shoulder and the single spiral on her neck were the same bright indigo blue that streaked through her hair. Aiyan sported chopped, chin length brown hair with just a hint of blonde hues along with one teal streak that lay across his forehead. A gift from Aiya. Thankfully his three tattoos; an eagle, triskele and Celtic cross; were permanently placed with the same indigo coloring. Where she was small he was tall, she exuded fragile he exuded strength. Upon closer examination you would see the same facial structure, angled chin and plump cheeks, with the most dominating brown eyes you would ever see. Their mother Amelia and her father Sasha carried the same almost unique brown eyes. Mia was a mere 5’2, shorter even than Aiya, with matching white blonde hair and a slightly more angular chin than the twins. Her small frame carried more curves than the road that circled Gaeland, to say she was a voluptuous beauty would be an understatement. Making their way through the palace she walked right past the entrance to the gym. This room housed every form of exercise imaginable. Fencing, swords, archery, weights, ballet and martial arts were practiced almost daily in the oversized room. Aiyan stopped short, “I thought we were going to spar?” he asked, his brow furrowed. “We are, outside.” “Oh- Joy.” he murmered. She chuckled as they rounded the corner and a slight tingle in her ankle accompanied with the visual of the gym brought a distant memory to mind. Aiya had gone with Rian and Raven to the forest for a day of hunting. Her father Rian allowed her and Aiyan the most freedom, and she was running around like an uncaged animal. They rarely got to be children in the confines of the palace walls, their mother Maya wouldn’t have it. Their studies were of utmost importance as they were to take over the parents duties one day, one day very soon actually. She recalled the memory with vivid detail and even moved to rub her ankle it was so vivid. Rian and Raven took turns grabbing her by her arms and spinning her in circles, at the time Raven was only fifteen or so but he had already nearly reached his six foot frame he now carried. Still dizzy and giggling she didn’t pay attention to the roots from the tree at her backside, exposed and protruding from the ground. She turned to run and three steps in just when she was gaining momentum she twisted her ankle and fell with an ear splitting shriek. Rian dropped his bow and scooped her up immediately, her tiny eight year old frame nearly invisible in his huge arms, shushing her. She’d twisted her ankle and to this day, she still felt an occasional pang of pain from it. When they’d returned to the palace she overheard her fathers discussing a similar incident with Aiyan when he and their father Cirian were fencing. He simply dropped on the matt and screamed in agony grabbing his ankle. Similar incidents happened over the years, but the twins rarely spoke of it to their parents, it always upset Maya and they avoided this whenever possible. Rian and Mia were the biological parents of the twins but their spouses, Cirian and Maya, were definitely the dominate parents. Oblivious to their surroundings they didn’t even notice the commotion around them. The boat carrying their matches and their families had arrived ahead of schedule. The palace was on alert finishing the final preparations for their guests. As they headed out to the cliff side to the matt, Maya and Rian made their way to their rooms to let them know about the change in plans. “He’s not in his room, and I didn’t see him in the kitchen when we passed there either.” Maya swung around and glared at him. “Aiya’s gone as well. What the hell are YOUR children up to this time? !” She turned not awaiting his response, and huffed back down the hall fuming. Rian followed close behind laughing at her. 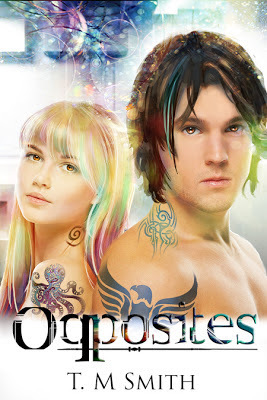 So, I hope you like what you see and you'll grab a copy here in a few days when Opposites is available via Amazon, Smashwords and hopefully Barnes & Noble in ebook form. Again, I apologize for the delay and do hope you will all bear with me while I get the book into tip top shape for you!